“Birth of Art” was discovered, labeled artwork, acquistitioned, evaluated, documented, conserved/cared for, placed on exhibit and pedagogically interpreted. BL Niven, Director of ICA•RDI in Second Life (SL), will confer with members of the art community and the press in the atrium of the Reuters SL Building, to designate February 19th as officially 'Art Administrations' Birthday'. ACTION VS OBJECTS - "Art's Birthday" was the action - "the dropping of a dry sponge in a bucket of water" NOT what 'Art Administrations' Birthday' celebrates "the sponge in the bucket of water"
While "Art's Birthday" (http://artsbirthday.net/) is remembered by relatively underground artists' events, 'Art Administrations' Birthday', although indirectly pointing to the former, is expected to be its own highly promoted and financially supported celebration. ICA•RDI is interested in the status of the artist in society. Report from the event on Wirxli Flimflams blog HERE. My Photoshop remix snapshot of the event, above & below. Art's Birthday: 17th January, an annual event first proposed in 1963 by French Fluxus artist Robert Filliou, born 17th of January 1926, died 1987. 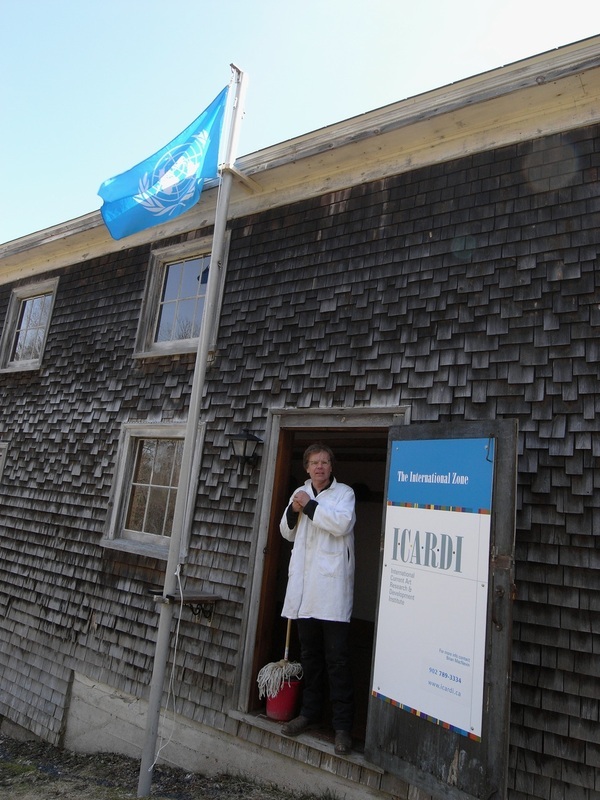 MacNevin's proposal in short: Lunenburg hosting an international artist-in-resident program as well as a symposium on the status of the artist. Well, ICA•RDI and mr. MacNevin has gone virtual, been born into Second Life, and already given us one more occation for having a party: Art Administrations' birthday. 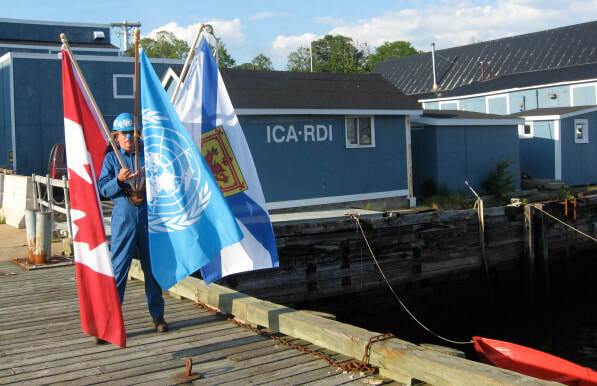 And mr. BL Niven has founded a new Second Life group: Friends of ICA•RDI. 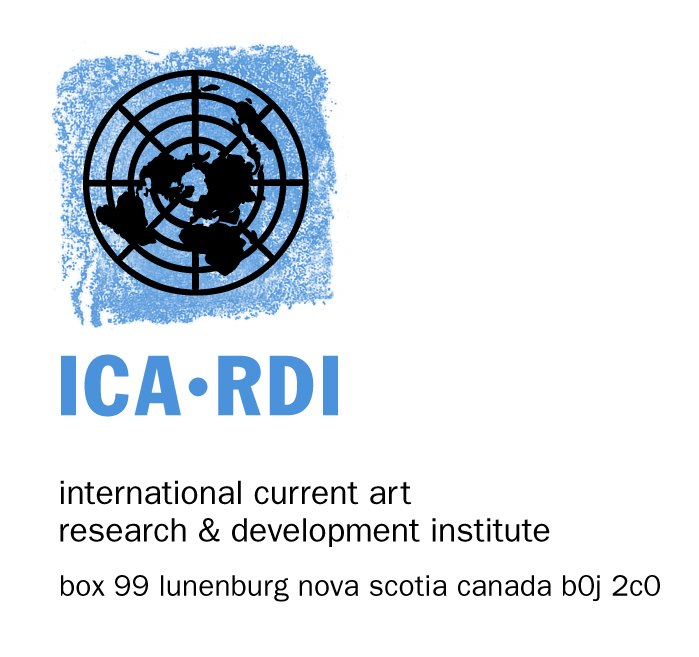 "International Current Art Research & Development Institute (ICA•RDI) is interested in conferring with artists internationally regarding the status of the artist in society. 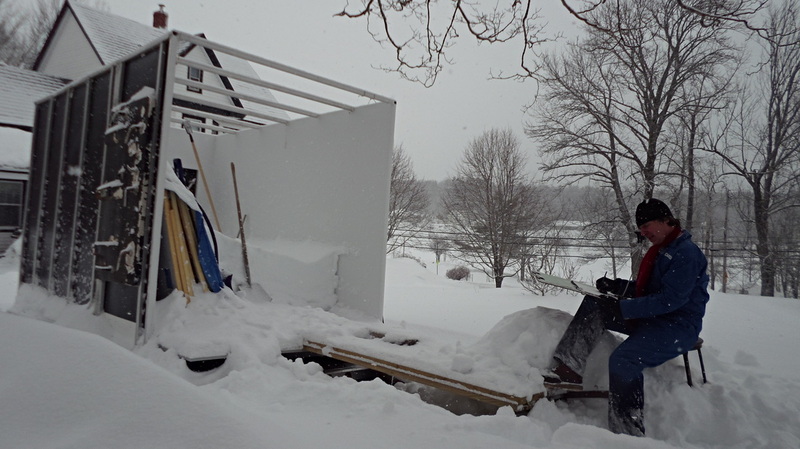 ICA•RDI is establishing a presence, an "office", in Second Life to continue this R & D, by way of organizing symposia/conferences, exhibitions & presentations of current art and hosting an artist in residency program all of which focus on the role of the artist in their community." MacNevin's son is named after Emmett Williams. MacNevin's son is born on February 19th. 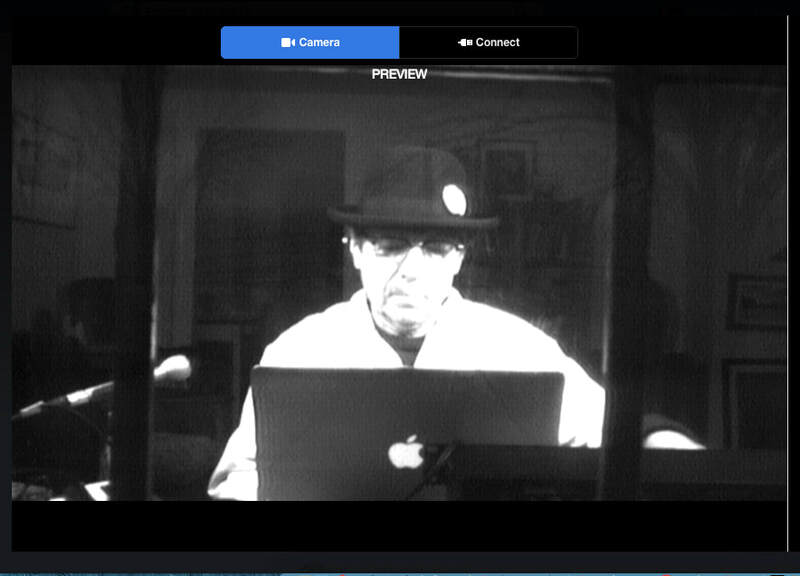 Well, we are very much looking forward to see all the wonderful ideas of BL Niven aka Brian Lee MacNevin come alive in Second Life! Art Administrations' Birthday - February 19th Art administration deals mainly with art as a noun (i.e. the objects). A few years ago being involved in art administration I thought it would be a good idea to celebrate Art Administrations' Birthday (est. 2007). It of course occurs after "Art's Birthday". Robert Filliou suggested that art was a verb, the action word, and he gave it a birthday, he said that art was born on January 17th when a dry sponge was dropped in a bucket of water. So a little over a month after "Art's Birthday" on February 19th (my son Emmett's birthday) I declared was Art Administrations' Birthday, it was the day when that saturated sponge from the birth of art (about a month after the action, a million years ago according to Filliou) was found floating in a bucket of water by an art administrator. And so began the celebration of Art Administrations' Birthday, which celebrates art the noun (e.g. the saturated sponge floating in a bucket of water). Therefore a little over a month after “Art’s Birthday” (January 17th) just under a million years ago, the object (the saturated sponge in a bucket of water) from the birth of art was discovered, labeled artwork, acquistitioned, evaluated, documented, conserved/cared for, placed on exhibit, historically contextualized and pedagogically interpreted. 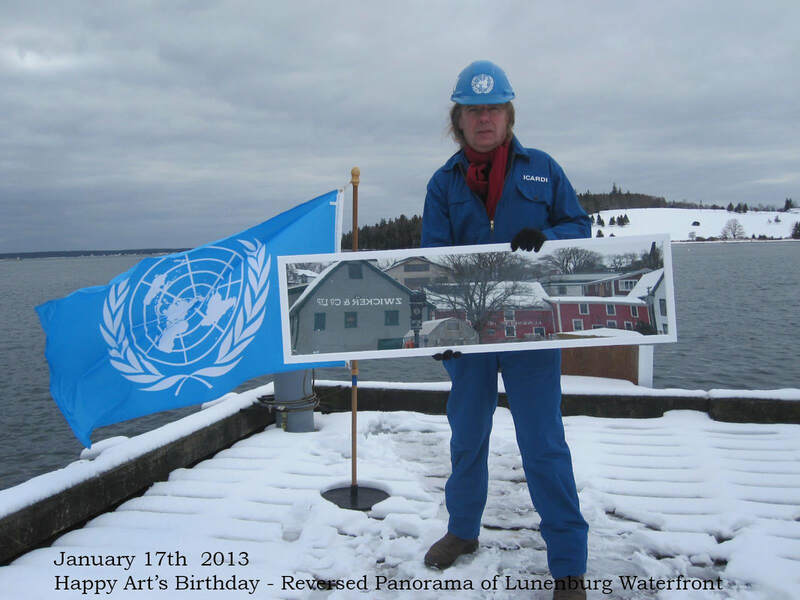 January 17th is Art's Birthday - In 1963 Robert Filliou declared January 17th (Filliou's birthday) to be Art's Birthday as an annual exchange-art event. He stated that art began a million years ago when someone dropped a dry sponge into a bucket of water. February 19th is Art Administrations' Birthday - In 2007 BL Niven, Director of ICA•RDI in Second Life declared February 19th to be Art Administrations' Birthday. 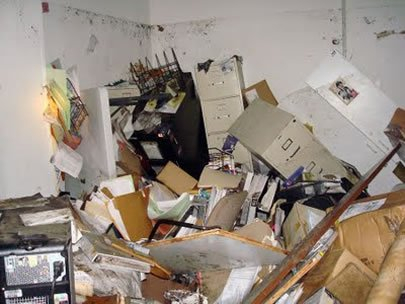 He stated that a little over a month after "Art's Birthday", just under a million years ago, the object (the saturated sponge floating in a bucket of water) was discovered, labeled artwork, acquisitioned, evaluated, documented, conserved/cared for, placed on exhibit and pedagogically interpreted. On display in the administrative office of the Khyber ICA from January 17th to February 19th, 2008 is a work by BL MacNevin entitled Exchange Agreement. The piece consists of two buckets linked together, a bucket of dirt linked to a saturated sponge floating in a bucket of water. 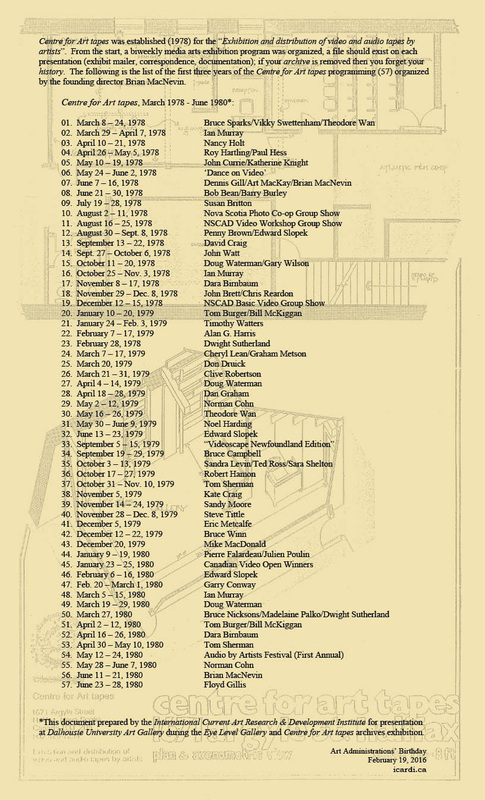 The bucket of dirt refers to the work by Allan Kaprow in which he exchanged the dirt in his bucket, i.e. he offered you his bucket of dirt to be replaced by your dirt, each new dirt held a story, the bucket functioned as a container for exchange like an art gallery. ​The dirt in this bucket comes from the basement of the Khyber Building, from the base of the old brick basement walls, this dirt has bits & pieces of brick in it that fell off the Khyber Building's basement walls, part of the building's very old foundation. 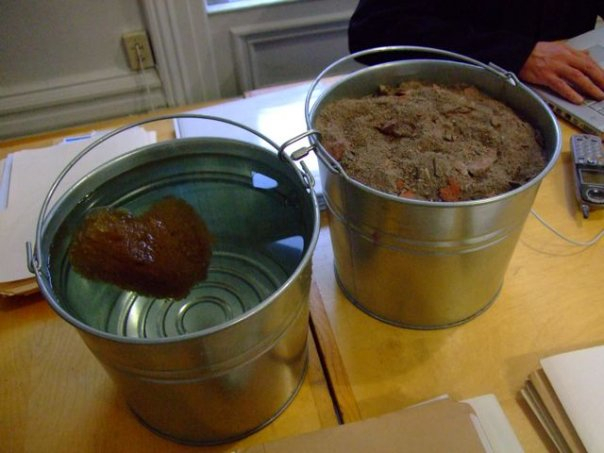 This bucket of dirt is a representation of Allan Kaprow's bucket of dirt and is linked to a representation of Robert Filliou's art object from the birth of art. As fundraiser for the Khyber Arts Society, this work is entitled Exchange Agreement, the value required for this work is $10,000, the amount now (February 2008) needed by the society to cover a deficit in this year's budget. 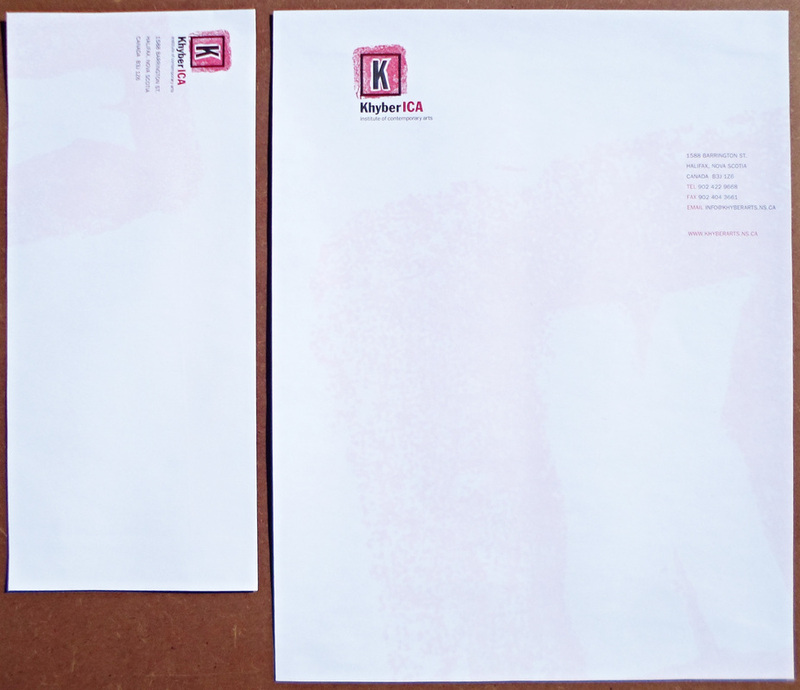 The Khyber Arts Society can offer a non-profit association charitable status tax receipt for the patronage. The Exchange Agreement (sponge in a bucket of water linked to a bucket of dirt from the Khyber Building basement) is still for sale, sale price of this work still stands, the funds will go to the Khyber Art Society towards their exhibition programming budget. 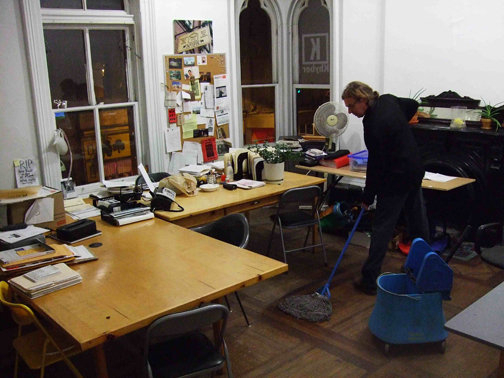 Working Late (above) - BL cleans up an artist run centre (Khyber ICA) on Art's Birthday, January 17th, 2009 as a public service, later he had tea and cake. 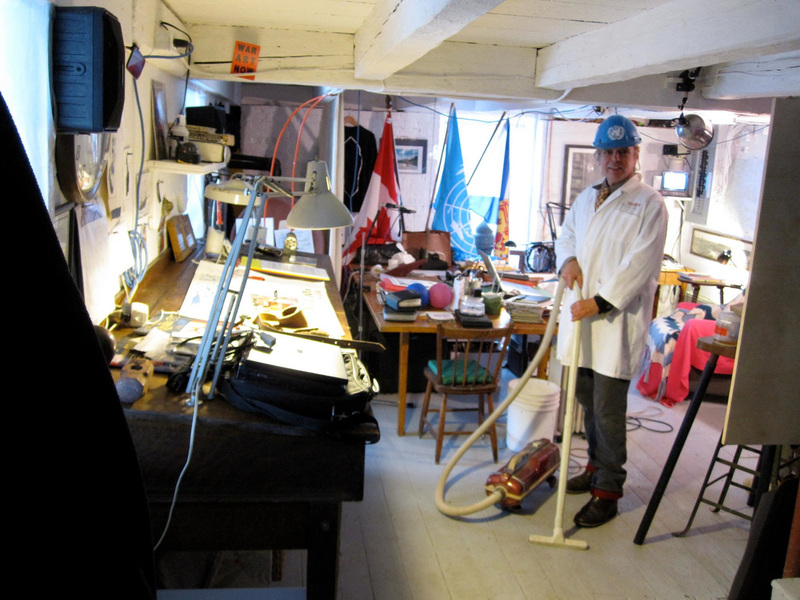 February 19th, 2009 Art Administrations' Birthday (right) - BL files the photo documentation at the Khyber Arts Society of him cleaning up the artist run centre (Khyber ICA) on Art's Birthday, January 17th, 2009, later he had tea and cake. 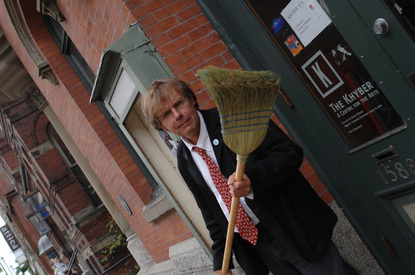 I use to work at the Khyber Arts Society as Artistic Director (plus Khyber Building Manager and Khyber Building Superintendent for HRM), to give a sense of professionalism to the position I wore a white shirt and tie. So every time I visited a 2nd hand clothing store I would purchase one or two 100% cotton white shirts and ties. The White Shirt & Tie Wall (for Garry) is 27 of the purchases that I made and wore while working at the Khyber ICA. A little over a month after Art’s Birthday (January 17th, Art's Birthday celebrates art, the action, the verb, i.e. according to Filliou, the birth of art occurred “when someone dropped a dry sponge in a bucket of water”), then just over a million years ago, the object (the saturated sponge in a bucket of water) from the “Birth of Art” was discovered, labeled artwork, acquistitioned, evaluated, documented, conserved/cared for, placed on exhibit and pedagogically interpreted = Art Administrations' Birthday. Art Administrations' Birthday, February 19th, celebrates art, the object, the noun, e.g. like the saturated sponge floating in a bucket of water... or the ancient cave paintings in Altair and Lascaux considered the beginning of art history. He said he was a "contextual/situational aesthetics institutional critique artist", and she said, “Can you draw?". ICA•RDI Ambassador installs a pile of a Centre for Art tapes administrative document as gallery handouts (the two-sided document below*) on the art gallery’s “FREE” documents table in the middle of the Centre for Art tapes archive exhibition at Dalhousie Art Gallery entitled “Why are we saving All these publications + Other Galleries stuff? 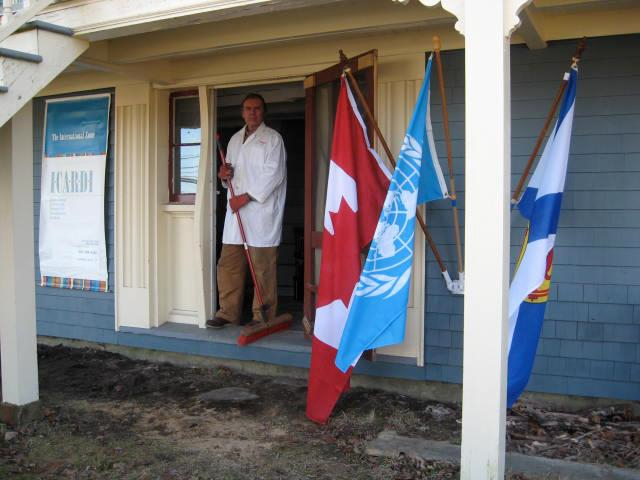 - The Emergence of Artist-run Culture in Halifax”, January 22 to April 17, 2016, later he had tea and cake. 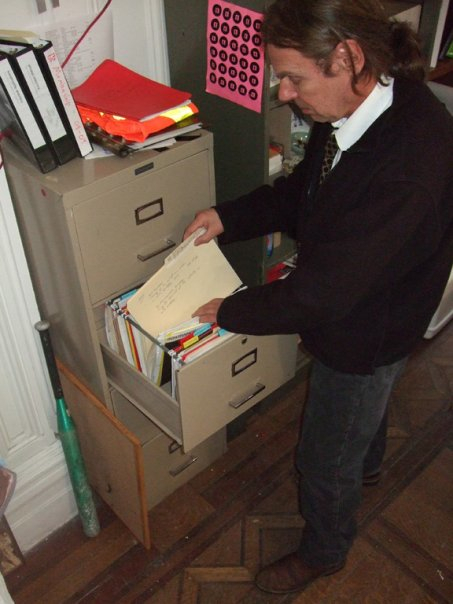 Each administrative two-sided document (above) is initialled and dated for Art Administrations’ Birthday, February 19, 2016 and is created for the Centre for Art tapes archive exhibition at Dalhousie Art Gallery entitled “Why are we saving All these publications + Other Galleries stuff? - The Emergence of Artist-run Culture in Halifax”, January 22 to April 17, 2016. 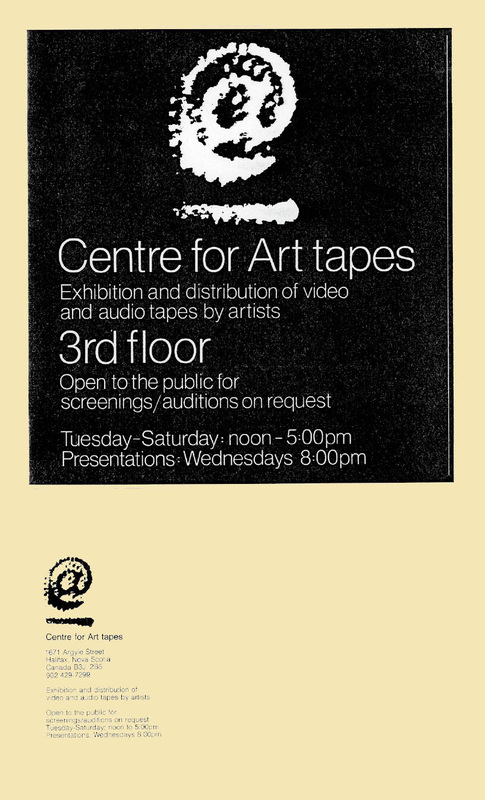 Above right: BL MacNevin, Centre for Art tapes, Founding Director, 1978, photos by Chris Reardon. 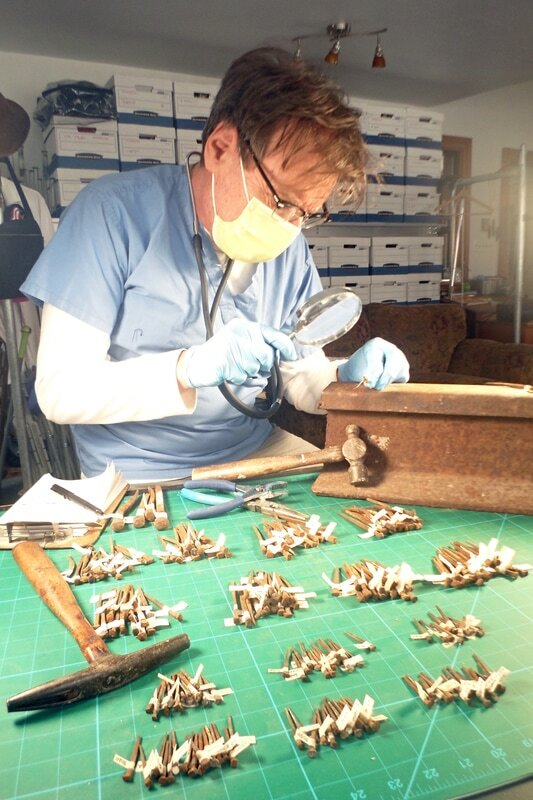 Straightening Nails - Between Art’s Birthday (January 17th) and Art Administrations’ Birthday, February 19th 2017, the ICA•RDI Ambassador 1. examined, 2. categorized & labeled, 3. straightened, Heritage Square Nails, South Shore Nova Scotia, Canada. 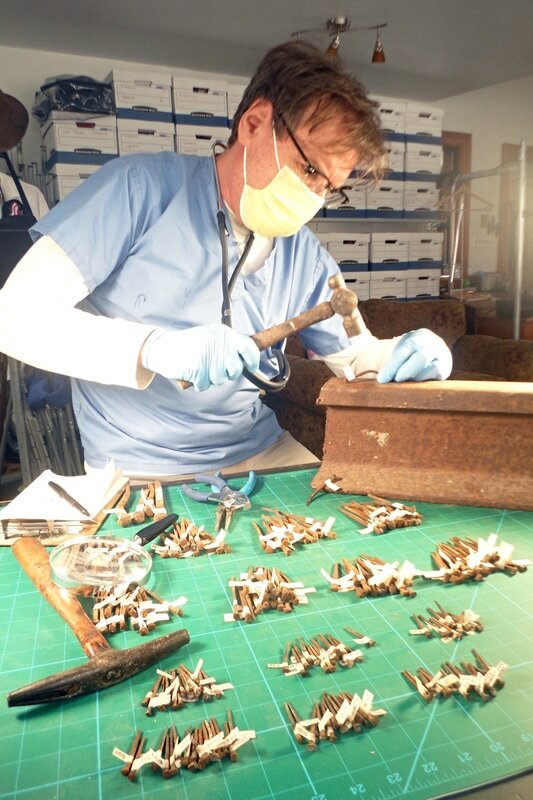 Long winters spent on the South Shore of Nova Scotia straightening the heritage home renovation square nails from the ICA•RDI inventory priceless collection. 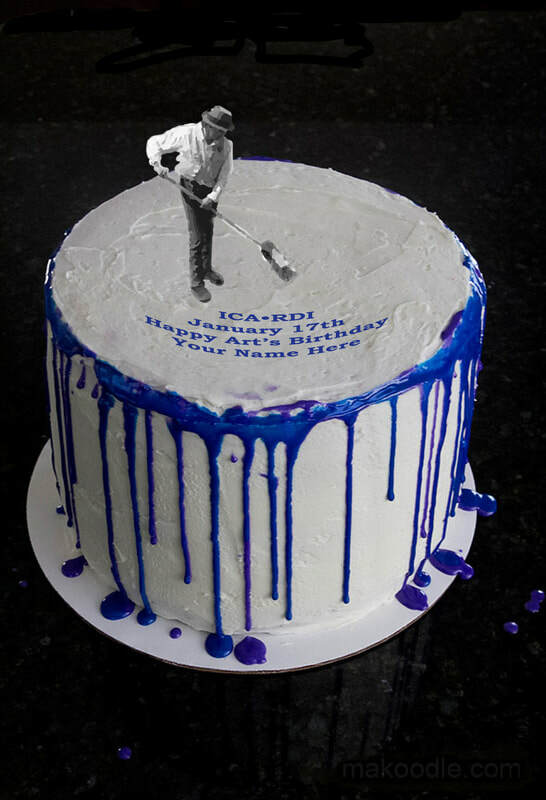 ICA•RDI Art's Birthday Cake, we reference what we like of the past. 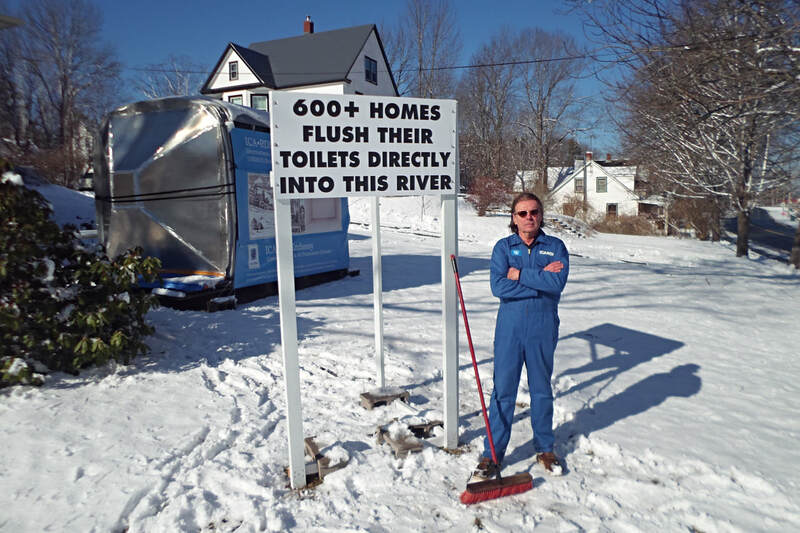 Public Art Administration - ‘Re/presentation of South Shore Signage’ (2018, after a 2016 artifact)), installed on the front lawn at the ICA•RDI Residence for Art Administrations’ Birthday, February 19th 2018. ‘HAPPY ART’S BIRTHDAY, JANUARY 17, 2019' - Audio by Robert Filliou (17 January 1926 - 2 December 1987) - This recording of Robert Filliou giving his lecture a ‘Whispered History of Art’ was recorded at New Wilderness Studio in New York by Ondine Fiore in December 1977. Robert Filliou was a French Fluxus, actions, performance artist, sculptor, installation artist, graphic artist, as well as art theorist and pedagogue. 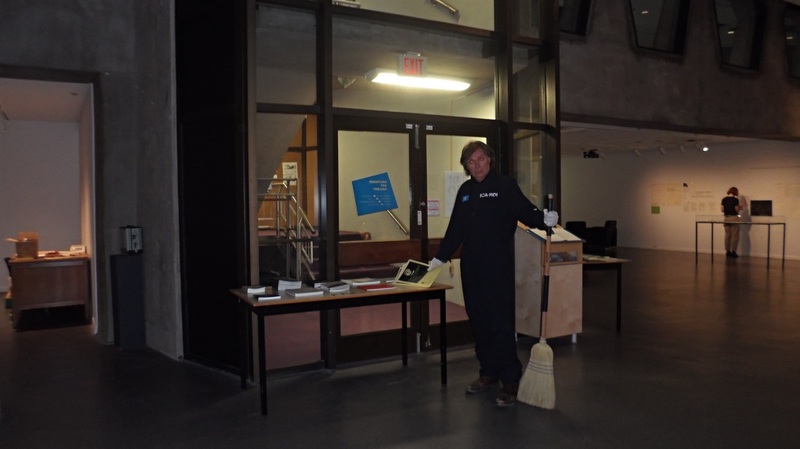 ​ICA•RDI Ambassador documents the 'Exchange Agreement' (2008) placed in front of the Farley Mowat sculpture on Art Administrations' Birthday, February 19th, 2019, later he had tea and cake. In 'Canadian Art Administration’, what is seen as the possible pinnacle for one’s career, would it be at the National Art Gallery, or at the Canada Council? What is the ultimate aspiration of the Art Administrator? In 'Canadian Art’, what is seen as the possible pinnacle for one’s career, would it be an exhibition at the National Art Gallery, or a major award from the Canada Council? What is the ultimate aspiration of the Artist? Artists tend to support other artists, their peers, who create art in a similar manner. ART TEACHING & ART ADMINISTRATION CONTEXTUAL ART represents artists who work as professional art educators and/or artists who work as professional art administrators and have found a way to integrate the actual context of their art education and art administration careers directly into their art making practice. We are talking about an ‘art form’ that is an intrinsic part of the 'art teaching' and 'art administration' contextual framework, i.e. the context of art teaching and art administration drives the work, this does not include artists who complete their art teaching or art administration day job and go home to a studio art practice that is perceived as separate.